But we transsexuals are not alone in being continually attacked by anti-knowledge. [T]hey stake their claim to authority through an assertion of a peculiar kind of expertise, in particular, the ability to interpret technical knowledge and to divine social patterns, while at the same time decrying the authority of the more specialized skills that produce facts and interpretations with which they disagree.More simply: no one knows anything except me. More broadly, the game now is to paint one side — the side that did not author our current disaster — as a hopelessly out of touch and inherently incapable group of impractical experts, folks who know only theory and have none of the so-called common sense needed to recognize that the succour of the rich and powerful is the alpha and omega of sound policy. It’s Spiro Agnew updated for the digital age…. I proudly declare that you can take my nattering-nabob negativism from me when you can pry it from my cold dead hands (and mouth and keyboard…)! and, because of this fresh injection of Marriage Derangement Syndrome, aren’t likely to any time soon. Arizona Congressman Trent Franks told blogger Mike Stark that African Americans were much better off under slavery. Of course, that’s not how the bill is titled. But that is what the bill will do if it becomes law. But even among states that punish illegal abortions, this “Criminal Miscarriage” law is unique. It not only punishes individuals who perform illegal procedures; it punishes women. I’ve long thought that one of the biggest mistakes made by the pro-choice movement was to cease using what I think was probably THE ad that would convince even many anti-choice-oids that abortion should be legal. Sadly, I can’t even find a copy of the ad; I think it ran in Rolling Stone a few times back in the 1990s, but I can’t recall for sure. The image was of two Dragnet-backlot cop figures standing at the front door of a residence. The door is partially open. A woman inside the house peeks out the door and, in looking at the cops, has a scared, horrified look on her face. Welcome to Utah – where, if the bill is signed into law, all women will instantly become presumed criminals. Sarah Palin isn’t even president yet. Mosi Tatupu, one of the most popular players in New England Patriots history known for his inspired special teams play, has died. Tatupu died Tuesday at Sturdy Memorial Hospital in Attleboro, hospital spokeswoman Ashley O’Brien said. He was 54. No, he’s not one of the three illuminated by the flash. But, if you look close – at the far left – you can see him in the shadows. 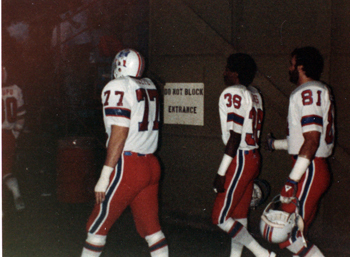 In 1980, you could get that close to the players at NFL games. No, I’m not talking about Alice Dreger or Michael Bailey – neither of whom are smart enough to be quiet. 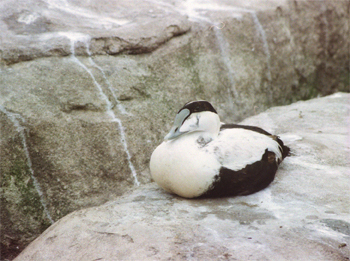 … its just someone I ran across at the Como Park Zoo in St. Paul a decade or so ago. 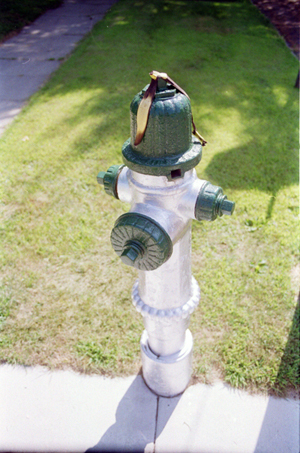 … and its remains are sitting on top of a fire hydrant in Minnesota approximately a decade ago. You may now return to your regularly-scheduled cynicism. You are currently browsing the ENDAblog blog archives for February, 2010.